In my never-ending quest in search of francophile life in the universe, this week Polly-Vous Francais is heading west, to San Francisco. I'm so accustomed to transatlantic jet-lag, it'll be fun (well, so to speak), to experience the transcontinental variety. 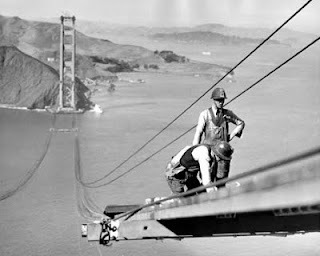 Mostly I'm looking forward to discovering the charms of the Bay Area and its many French cultural and culinary delights. Oh, and if this is one of your suggestions -- sorry, I'm not biting. Dear Abby: Should I go to France? There's always a first time for everything. Today I wrote to Dear Abby. No, no, no. I didn't ask her how to solve any of my dilemmas (what? me worry?) but to commend her for a spot-on response to a college student's quandary. You can read the rest here (after the grandma's grooming query). Should I cancel my newspaper subscription? Sometimes a news item comes across ye radar screene that has little to do with the general thrust of this blog. And such was the case today. I learned, to my utter dismay, that an Australian chocolate bar with the delicious name of "Polly Waffle" is about to be given the axe by the Nestle chocolate company. Really. How dare they? Just in time for the holidays, and Polly gets a pink slip. So heartless. Honestly, corporate HQ, what were you thinking? 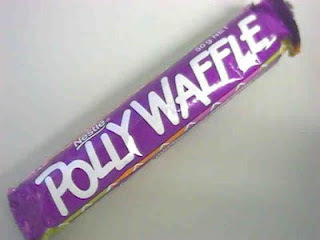 Polly Waffle has been around for 62 years, way longer than yours truly. Surely it's not age discrimination? In any case, the name is so... catchy! There is even a Facebook group to save the Polly Waffle. Meanwhile, back at the ranch, I'm compiling my next post about the top ten things I still haven't adjusted to one year after my departure from Paris. Stay tuned. In honor of Armistice Day -- Veterans' Day in the U.S. -- I've been thinking about Dough Boys, anciens combattants and old soldiers' drinking songs. Mademoiselle from Armentieres specifically. I'm sure I heard it while watching any number of old black and white movies about World War I, but never really retained much of the lyrics except the refrain, "Hinky-dinky parlez-vous." Which of course I used to think was... by George you've got it! Now that I have found out what some of the lyrics really are, I think it best if the bulk of the bawdy lyrics remain mumbled, kind of beer-sloshed as in this clip. Only 46 shopping days until Christmas, mes amis! If you've been fretting over what tender je ne sais quoi to put under the tree for that special francophile on your list, I have an idea for you. How about a piece of Paris? On Monday, December 14, famed Parisian auction house Drouot will auction off over 300 iconic pieces of Paris. Entitled "Paris Mon Amour," the sale will feature classic Parisian elements: a Belle Epoque newspaper kiosque, a metro ticket-punch machine, a Second Empire vespasienne (the street urinals of yore and lore). Old city benches (so romantic!). Ancient photos. But the pièce de résistance will be the sale of a 26-foot tall section of a wrought-iron spiral staircase from the Eiffel Tower. 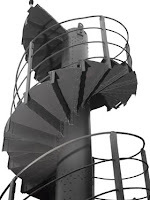 The 40-step staircase, one of the largest items ever on the block at Drouot, is expected to fetch between 60,000 and 80,000 euros. As you might imagine, Paris nostalgia buffs are expected to turn out in droves for the event. Bidding starts at 2 pm on December 14, Drouot Richelieu, 9 rue Drouot in the 9th arrondissement. Preview is Saturday December 12 from 11 am to 6 pm. Oh... thank you for asking. 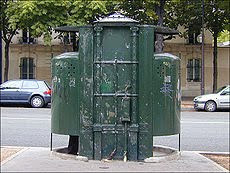 Yes, I'd like the kiosque, not the vespasienne. Images from wikipeda and Drouot. Mutual Admiration Society Film Festival? Let's face it, folks. We really do love each other, the U.S. and France. Or at least we are endlessly fascinated with each other. And there's no sign of this mutual admiration's waning. Au contraire. Here's a bit of culture news that caught my eye. Opening this week in New York is American filmmaker Frederick Wiseman's documentary of the ballet at the Palais Garnier. La Danse: the Paris Opera Ballet promises to be a fascinating glimpse behind the scenes at that elegant institution. So why did I laugh when I read the review? It had nothing to do with Wiseman's film per se. There was just a bit of ironic timing. A cultural juxtaposition, the kind that always hits my funny bone. This week at the Virginia Film Festival, French cineaste Claude Miller will be screening the American debut of Marching Band. Both of these documentaries are appealing. I can't wait to see them. But it tickled me to realize that this week in film news, France sees American culture through the lens of two southern university marching bands, whereas America views French culture as quintessentially elegant ballet. Anyway, I was thinking how fun it would be to screen those two movies together. Because, really, we do love each other, we French and Americans. Are we drawn to what we find most exotic in the other culture? So my morning java-inspired idea began evolving. There are already a host of excellent French Film festivals in the US each year. And of course the Deauville American Film Festival in France. But how about creating an annual French/American film festival, to be held on both sides of the Atlantic? It would feature, side by side, French documentaries about the US and American documentaries about France. In France the screenings would no doubt be accompanied by débats philosophiques sprinkled with the phrase regards croisés. Maybe a flute of champagne. In America they would probably be accompanied by hot dogs and apple pie, plus brie and baguettes. Right? Labels: arts and entertainment, francoFiles, ideas, where am I?